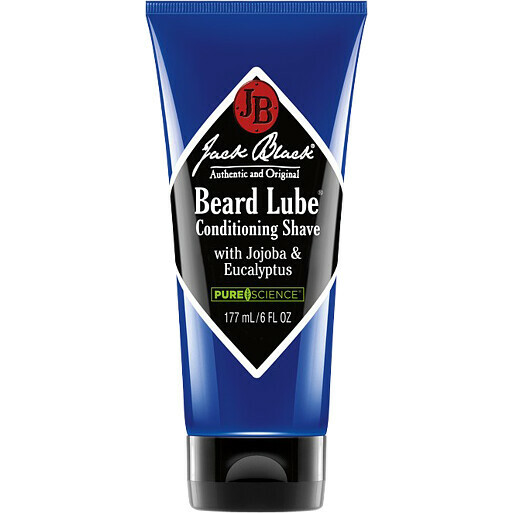 Beard Lube is really different from whipped-cream style foams and gels. It is a pre-shave oil, shave cream and skin conditioner, all in one. Jojoba and macadamia nut oil help prepare your beard by penetrating and softening whisker growth. The lightweight formula provides a thin, lubricating layer to hold-in moisture so the blade glides easily through your whiskers, while eucalyptus and peppermint refresh your skin. This means an easier, smoother shave, and less razor burn. The unique see-through texture lets you see your face while youre shaving, helping to prevent nicks and cuts (its also great to shave around the line of facial hair, such as side burns or a mustache.) And, Beard Lube wont clog your blade, because its super light and rinses easily. Fragrance-free. Colorant-free. Work a quarter-sized amount of Beard Lube into your slightly moist beard. Beard Lube has built-in moisture, so you dont need a lot of water. Glide razor over face. Rinse with warm water. You`ll really feel the difference on your skin.